CANCUN — Within the framework of the United Nations Conference on Biodiversity (COP13), the National Commission on Natural Protected Areas (Conanp, for its acronym in Spanish) and Grupo Experiencias Xcaret signed an agreement to strengthen the recovery program of the red macaw in the jungles of Mexico. 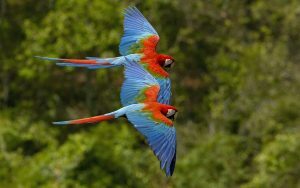 In a statement, the consortium of Quintana Roo indicated that this will formalize joint actions such as environmental education, management of specimens, research, training and financing, aimed at the reproduction and reintroduction of the red macaw in natural areas likely to receive them. This, it highlighted, will allow expanding the results obtained so far in the crusade for the conservation of the species, Notimex reported. It also includes the authorization of breeding and reintroduction schemes that will allow the program to expand to more habitats where populations of macaws can recover. The red macaw is part of the list of species at risk in the country and is on the list of the Convention on International Trade of Endangered Species of Wild Fauna and Flora (CITES, for its acronym in Spanish). However, in just over three years the population of red macaws in Mexico’s wildlife has almost doubled, through the plan to reintroduce the species in the states of Chiapas and Veracruz, led by Grupo Experiencias Xcaret, it said. This, the consortium said, was done along with specialists from the National Autonomous University of Mexico (UNAM, for its acronym in Spanish), civil society organizations, as well as local, state and federal authorities. According to the statement, among other actions, the agreement will identify potential areas with plant coverage that provides the basic resources for survival, feeding and nesting of the reintroduced populations. It will also be promoted that the local inhabitants of the areas where releases occur, take care of the environment and make the species an emblem of their natural heritage.